Panchen Ötrul Rinpoche has visited twice and helped bless the land and many Buddha statues in addition to teaching. Rinpoche was born in Kham, eastern Tibet, in 1939 to nomadic parents. He was immediately recognized as a reincarnate Lama. In 1951 Rinpoche was selected as the final candidate as the reincarnation of the Panchen Lama who died in 1937. However, due to the political situation at that time, another candidate was selected. Rinpoche was then given a new title, conferred for the first time by the Tibetan Government, of Panchen Ötrul, which means Panchen Candidate. 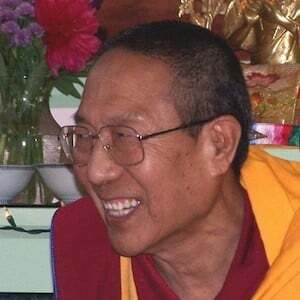 Rinpoche completed his formal studies at Drepung Gomang, where he was awarded the highest degree of Geshe Lharampa (PhD) in Tibetan Philosophy. He also studied Sanskrit and Hindi at Varanasi University. Rinpoche is now Spiritual Director of Jampa Ling Tibetan Buddhist Centre in West Cavan, Ireland. At the request of His Holiness the Dalai Lama, Rinpoche regularly travels to Mongolia to help with the reestablishment of Buddhism there. Rinpoche also teaches in Malaysia, Singapore, the US, and Europe. Read Panchen Ötrul Rinpoche’s thoughts on the Abbey. View photos of one of Rinpoche’s visits.